All Saints is a Victorian church, built in the 1860s to serve a newly created residential area north-west of the town centre of Nottingham, following the 1845 Enclosure Act. Land taken from what had been common fields until the 1840s was gradually sold off by the enclosure commissioners. Their task following the passing of the enclosure legislation was to lay out the streets and facilities in preparation for building in the area. William Windley, a wealthy Nottingham silk merchant, acquired the site on Raleigh Street in order to commission a privately funded church to serve the area. All Saints was designed by one of Nottingham’s premier Victorian architects, Thomas Chambers Hine, funded by Windley, and built 1863-4. It is a large, well-composed building in 14th century Gothic style with a west tower, a broach-spire and a polygonal apse to the chancel. It is rock-faced with bands of sandstone. 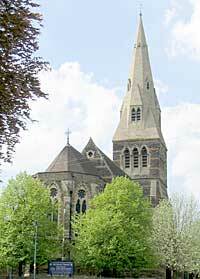 Windley also commissioned a matching school with round tower, vicarage, and church institute. 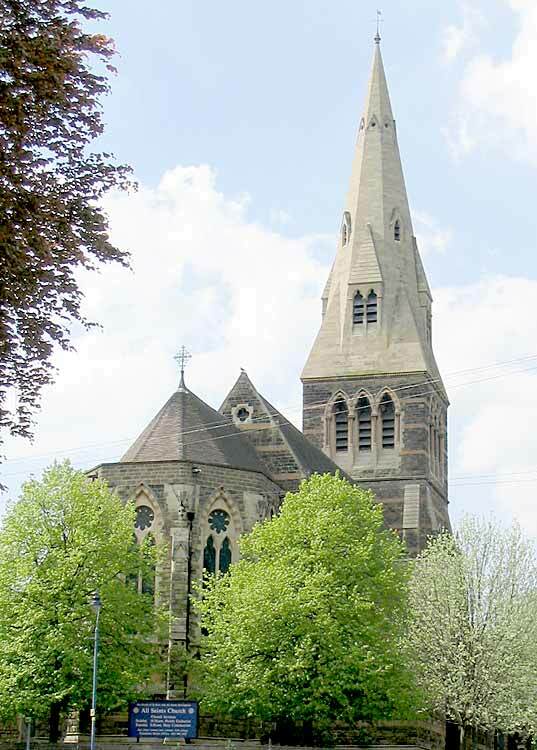 Since 2009 the church has been in joint ministry with St Mary’s and St Peter’s, Nottingham.